This tray can hold 3 Leman Russ Tanks, 12 Heavy Weapons Teams stacked or 6 Sentinels and 1 Chimera. 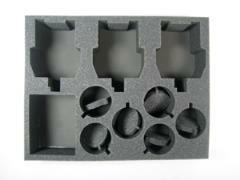 Spacers for the heavy weapon teams are included with this tray. 3 inch thick tray with 1x 5 x 3 3/4 inch cut out.